During lunar eclipses, native residents in the Arctic still turn over their utensils to prevent contamination. Other societies view the occurrence as a frightening event. In ancient China, people believed a sky dragon ate the moon and flooded it with blood before ingesting it whole. The moon always comes back, but there was much speculation about how. The Greeks, however, were ahead of their time when they said the Earth was round, citing the shadow the Earth casts as evidence. Nearly 500 people, bundled in coats, hats and gloves, showed up Saturday night at the sundial on McKeldin Mall to view the total lunar eclipse, which occurs when the Earth's shadow fell across the full moon, blocking it from sunlight. The partial eclipse started about 6:30 p.m. The moon was fully eclipsed between 8:06 and 8:31 p.m., but a disappointed crowd saw clouds shield the moon from view at about 8:20 p.m. If it had been visible, they would have seen the moon leave the Earth's shadow at about 10 p.m.
Before the cloud cover, university students and local families waited in long lines that wrapped around the sundial to look through two 8-inch reflectors and a 6-inch refractor, which were provided by the university's observatory. People had good company and enough hot chocolate to keep warm on the chilly night. "It's brighter than I expected," senior astronomy and math major Jeremy Miller said. "I didn't think I would be able to see it without a telescope." The intense red-orange shades of the moon came from sunlight, which is reflected from Earth's atmosphere. A contributing photographer from Sky & Telescope magazine once said an eclipse was "like a distant peach hanging in the sky." Astronomy Aficionado Benson Simon, former president of National Capital Astronomers, set up his Nikon F5 camera at 7 p.m. to prepare to take a series of timed exposures, with one exposure taken every 10 minutes for two hours. In August, about 2,000 people turned out during a four-night period to view Mars - which was the closest it had been to Earth in 26,000 years - at the university's observatory on Metzerott Road. The observatory's director, Elizabeth Warner, organized the lunar eclipse gathering on the mall because the observatory cannot accommodate as many sky watchers. Warner said she encourages people to visit the observatory on the 5th and 20th of each month for regular observation or a tour of the facility. 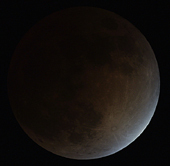 Saturday night marked the second and final chance in 2003 to see the moon disappear in a total lunar eclipse. Two more are expected in 2004. After next year, a three-year total lunar eclipse drought is expected.